There are a wide variety of places to stay in Miami Beach, ranging from top dollar to low budget discount. Keep in mind that classic Art Deco usually means smaller rooms. With any hotel, ask about specials, amenities, view, and room sizes. Here are some recommended hotels in the Miami Beach area. Avalon Hotel (800) 933-3306, (305) 538-0133. Trademark yellow 55 Lincoln Convertible parked in front. Beach Paradise Hotel (800) 258-8886, (305) 531-0021. Café, in-room movies. Brigham Gardens Guesthouse (305) 531-1331. Lush gardens, barbecue area and pets welcome. Indian Creek Hotel (305) 531-2727, (800) 491-2772. Art deco style, serene hotel with a pool. Leslie Hotel (305) 534-2135, (800) 688-7678. Babysitting service. Park Central Hotel (305) 538-1611, (800) 727-5236. 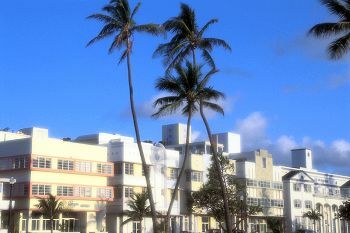 Deco-classic with small pool, and rooftop deck to watch cruise ships or activity on Ocean Drive.